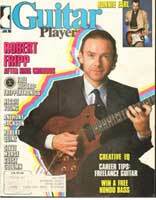 Since 1981, Robert Fripp has used Roland guitar synthesizers - the GR-300 and recently the GR-700. He recorded with them on King Crimson’s Warner Bros. albums (Discipline, BSK-3629; Beat, 23692-1; and Three Of A Perfect Pair, 925071-1), accompanied by fellow Roland synthesist Adrian Belew. He also played synth on two LPs with Andy Summers (see story beginning on page 113), and employed a GR-700 on the January 86 Guitar Player Sound-page, "Easter Sunday. " After five years with guitar synths, what are your feelings? I have major reservations about the guitar as an effective synthesizer controller. With the keyboard synth, the response of the "fingerboards" is now developed to a point where a good pianist - or a good electric pianist - is not likely to have any reservations. For example, the original Moogs limited a player’s performing capacity. I don’t think that’s an issue anymore. But if you come to the guitar, there are two difficulties. One has to do with its inherent limitations; the other is the problem of the guitarist’s. Let’s begin with the guitar’s limitations as a device for triggering the synthesizer. If you pick any one string, then there is a likelihood that at least two more are going to vibrate. If the response of the synthesizer is going to be very keen, then you’re going to be getting three notes responding instead of one. On a keyboard, it would be something like every time you played one note, you would "ghost" between two and five more around it, which wouldn't be acceptable. Then the guitar synth would create strong superfluous notes simply by picking up the sympathetic vibrations of the overtones. That’s it. So, in other words, one has to find a way of damping the other strings while picking the one. In practice, that’s going to be very, very limiting for right-hand technique. Now let’s look at the performer’s end of it. There’s currently no truly accepted school of picking for the plectrum guitar. We have two approaches: the suspended hand, where the right hand doesn't actually touch the string at all, and the pivotal method, where the hand is pivoted off the ball of the thumb, which rests generally on the bass strings. The problem from both these points of view is, first, the sympathetic responses. Second, if you use the pivotal method, then you’re very likely to rub the strings and set off glitches that way. However, if you find a way of overcoming this - and it’s possible, to a degree, by being very careful - then you find that the tracking response of the synthesizer, even on the best that I've tried, is about a tenth of a second late. If your aim as a player is to be able to work in the area of semi quavers [sixteenth-notes] at 152 beats a minute, say, that’s 10 notes a second. So the response is always behind your picking. And in fact, I don’t believe that a synthesizer can track with that level of accuracy. How have you dealt with these shortcomings? I abandon my technique and view it as essentially a new instrument. In other words, I can’t approach it as a guitar player with the emphasis on playing. I use it to extend the tone and pitch ranges of the instrument. For example, I can get an octave higher simply by setting the oscillators. So, if I'm prepared to accept the restrictions on my own performance capacity, I can have an extended range in timbre and in register. That’s the good side of it. What attracted you to an instrument with apparent shortcomings? I've worked with the GR-300/G-303 system just about from the day that it came out, and I found it very useful. It's limited, but within its limitations, it’s very broad. It’s quite a good player’s instrument; the response isn't bad, although there is a delay. As with any guitar synthesizer, it’s not good for someone who is very interested in picking. So if one’s approach tends more toward being left-hand active, it’s useful. The next stage, the GR-700, I like to a degree, but the response was so bad in the tradeoff between performance and efficiency, on the one hand, and the extended range that I wasn't prepared to go for it. It would have meant losing too much in the performance ability. I didn't like the new guitar, either. The guitar I'm using at the moment to trigger the 300 is a Tokai Les Paul copy with its electronics modified by an Englishman named Ted Lees He also fitted it with a Kahler tremolo. It’s a very fine guitar, and it’s a useful synthesizer. Have you tried any of the other new synth systems? I think the Synclavier would probably be the best bet. No, I haven’t tried them. My feeling is that the guitar may well never be the instrument to trigger a synthesizer. I saw one of who I would consider the finest guitarists in New York with the Synclavier, and he was sounding like a bad saxophone player. To me, the point of the synthesizer is not really to sound like ordinary instruments that are lacking their natural vitality. The opportunity is to come up with an entirely new range of sounds for the electric guitar and a new musical vocabulary to go with it. For example, when Charlie Christian put a pickup on his guitar, he wasn't playing the licks of an acoustic guitarist. There was a new music to go with this essentially new instrument. When Hendrix added wah-wah and fuzz, it wasn't an updated Charlie Christian; it was an entirely new instrument with a new sound, a new vocabulary, and new music to go along with it. Therein lies my interest in the guitar synthesizer: that something entirely new will appear. But my hunch is that the technology hasn’t quite gotten to the point to enable that to take place. Perhaps it’s not so much a question of enhancing the pitch-to-voltage tracking, but rather of adding artificial intelligence so that the controller can somehow predict what you’re going to play. Well, in a sense, yes, but I think we also need that one player to come along with an entirely new music for it. That hasn't happened to it. I suppose a good example of how Adrian Belew and I used the Roland GR-300 with King Crimson is "The Sheltering Sky." Although it’s available on the Discipline album, it was infinitely better live. When we were in Japan, Roland met with Adrian and told him that we were using their guitar synthesizers in a way that they had never anticipated. I think they expected, if you like, beginner guitarists or less proficient guitarists to play fairly simple things that sounded relatively amazing. Whereas we took them really as new instruments and tried coming up with something that was quite novel. Did you make any suggestions for improving them? I made the same comment about the response, and they were aware of the general problem. The guitar itself was quite excellent, and probably the most accessible for players. But it didn’t overcome what I felt needed to be overcome: the immediate response. And the difficulty is that if you come up with a pickup that responds with the sensitivity that I would like as a player, then the glitches, the bad harmonics, the sympathetic notes, and odd resonances that creep in really overwhelm the fundamental. So we’re back to the problem that I don’t think guitar technique and synthesizers really go together. Unless you’re prepared to come up with an entirely new approach to an entirely new instrument. Is it important for a controller to be able to double as a standard guitar? For the working musician, yes, it’s very important. For the person in the studio, it’s not quite as important. The other approach is going the analog route, where there are so many effects available to the guitarist and where the control capacity from the guitar is so much better than from a synthesizer. It’s so extended the range of the electric guitar, it’s almost better to go the route of straight electric guitar with effects. The disadvantage is that you have a limited range, because the Harmonizer an octave higher won’t give you the same effect as the oscillator tuned up. I use the synthesizer to power the whole range of normal guitar effects - distortion, flanging, all the bit. For example, heavy chorus works very effectively on what normally passes for a high string sound. Or if you put a very heavy chorus and fuzz on the 300 when the fundamental is tuned to a root and a fifth, you get something very close to heavy ring modulation. It’s a very wonderful ripping, chainsaw sound. There must be some good points about the guitar synth. My own view is that it is still on the way. In the same way that Les Paul was somewhere in between, if you like, Barney Kessel and Jimi Hendrix. But he was on the way there. He was obviously more interested in electronics than Kessel or Charlie Christian, but it wasn't quite the new instrument that it was in the hands of Hendrix. That’s roughly where I think we are. Guitarists might be reluctant to give up some of the control they ie accustomed to. Yes. Which is another way of saying that the guitar synthesizer at the moment isn’t a good instrument for players. In order to make the guitar synthesizer work, a player of some competence has to give up some of that competence in order to develop a completely new, much cleaner, technique. And to make it cleaner, it has to be more economical a style, generally. To do that means you have to select exactly the notes that you’re going for, and you can’t fudge as much. So it imposes quite considerable demands on a player. For years many keyboard synthesists have tried to emulate the expressive nuances of the guitarist, and now, in many respects, the opposite is occurring. Well, ironically, you can probably get a better guitar synthesizer sound through a digital keyboard synthesizer. It comes back, again, to we’re not quite there yet. There’s a lot of interesting stuff about, but we’re not quite there.